Following these tragic events, Helen Clarke moved back east and had a brief but successful acting career in New York. In 1875, she returned to Montana, where attorney and family friend Wilbur Sanders found her a teaching position in Helena. Not everyone in Helena was happy with her hire. 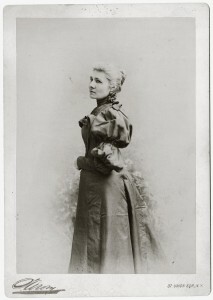 Elizabeth Chester Fisk, whose husband edited the Helena Herald, withdrew her children from school because she objected so strenuously to Helen’s mixed ancestry. However, enough Helenans were accepting of the refined, devoutly Catholic, and talented woman that they elected Clarke county superintendent of schools in 1882. She held the position for three terms—one of the first two women (and only person of Indian descent) to hold elective office in Montana Territory. In 1889, Clarke left Montana to work for the Indian Bureau. Two years earlier, Congress had passed the General Allotment Act mandating the allotment of tribal lands to individual Indians and allowing the government to sell “surplus” reservation land to whites. Allotment began in Oklahoma, where the Otoes and Poncas—who had purchased their tribal lands outright—stood in strong opposition to allotment. Hoping her Indian ancestry might help her persuade the Otoes and Poncas to cooperate, the bureau hired Clarke as an allotment agent. “Being identified with the Indian race, it is probable that she would be able to exert a greater influence with them than one who is not so identified,” the commissioner of Indian Affairs suggested. After four years among the Otoes and Poncas, Clarke moved to San Francisco, where she established herself as a tutor of “artes, elocution and dramatic art.” Unfortunately, anti-Indian prejudices followed her to California. In 1901 a “special correspondent” from the Helena Herald to the San Francisco Chronicle submitted an article that took aim at Clarke’s mixed-blood status, declaring, “Miss Clarke was proud, and when it was demonstrated to her humiliation that her birth prevented her from taking the place in society her education and refinement warranted, she decided to leave Helena.” The article asserted that, although she was beautiful, “Miss Clarke was known to be the daughter of a Piegan Indian woman, and this fact caused for her to be looked down upon socially.” The article alienated Clarke from some of San Francisco’s high society and she left the city in 1903. Clarke returned to Helena just long enough to grant the Helena Daily Record an interview in which she asserted there was no shame in having mixed ancestry. She then moved to the Blackfeet reservation, where her arrival came at a fortuitous time for the tribe. In an effort to strong-arm the Blackfeet into accepting allotments, the agent there had struck over 90 percent of tribal members from the ration rolls. The Blackfeet hoped Clarke, as an educated woman with some standing with the federal government, could help. She pursued charges of maladministration against the agent, eventually succeeding in getting him removed from his position. In 1909, Helen and her brother, Horace, were granted tribal membership and allotments, but, ironically, the Interior Department still required her to prove her ancestry as well as her “competency” so that she could own her allotment outright. Clarke’s role as a school superintendent was rare, but other Montana women asserted their political power in the position. To learn more, read Expanding Their Sphere: Montana Women in Education Administration and Public Health. To learn more about marriages between Native women and white men, read Brokers of the Frontier: Indigenous Women and the Fur Trade. Want to learn more? Read Andrew Graybill’s article, “Helen P. Clarke in ‘The Age of Tribes’: Montana’s Changing Racial Landscape, 1870-1920,” published in Montana The Magazine of Western History 61, no. 1 (Spring 2011): 3-19. You can find links to the full text of all Montana The Magazine of Western History articles relating to women’s history here. Brief news column includes Clarke’s charges against Agent Monteath. Boston: Sacred Heart Review 30, no. 17 (October 24, 1903)3. Marshall, Michigan: Marshall Expounder, Friday, October 30, 1903:2. Chapman, Berlin Basil. 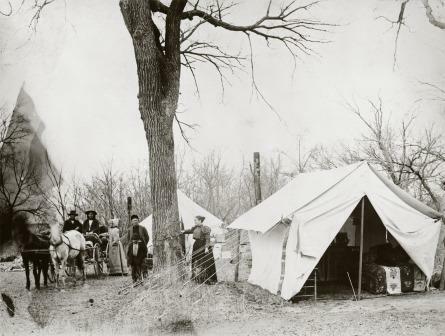 The Otoes and Missourias: A Study of Removal and the Legal Aftermath. Oklahoma City: Times Journal Publishing Company: 1965. Clarke, Helen P. Letter to Mr. Edwin Royle, February 15, 1911. Helena P. Clarke Papers, SC 1153, Montana Historical Society, Helena (hereafter MHS). Graybill, Andrew R. “Helen P. Clarke in ‘The Age of Tribes’: Montana’s Changing Racial Landscape, 1870-1920,” Montana The Magazine of Western History 61, no. 1 (Spring 2011): 3-19. Helen P. Clarke Papers, 1872-1934. SC 1153, MHS Archives. Helena Herald correspondent to San Francisco Chronicle. “Lost Everything through Indians.” Sausalito News, December 28, 1901. Reprint, slightly revised, of article that originally ran in the San Francisco Chronicle, December 21, 1901:2. “Maligned by a Newspaper.” Montana Daily Record, September 26, 1903. Photocopy in Helen P. Clarke, Vertical File, MHS. Andy Graybill’s The Red and the White: A Family Saga of the American West, the story of the Clarke family, is superb! Helen P. Clark was a strong, brilliant, talented woman ahead of her time. A woman for any age!